French mineralogist and chemist (1808-1862). 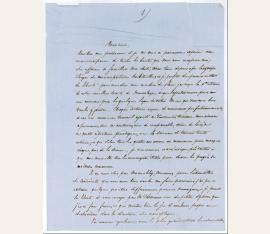 Autograph letter signed ("H. de Sénarmont"). N. p. Folio. 3 ff. In French, to James Dwight Dana, an American geologist and naturalist who published the fourth edition of his "System of Mineralogy" in 1854: "Forgive me if I haven't expressed my gratitude sooner [...] l am using the first free moment to tell you how much I enjoyed receiving the 4th edition of your excellent treatise on mineralogy [...] Each edition has added new perfections, and it is an immense piece of work added to other immense pieces of work. We have surely nothing [...] that compares to this vast and prodigal repertory where science is seen in its entirety and which arises every four years like a monument that marks each step forward of science. I do not know any other work that I can turn to to study the progress of our joint studies [...] I am equally obliged to you for sending me the sample of cordierite. I was able to extract a few pieces that were relatively pure and homogenous, and I am taking the liberty of sending you one of the small spheres I have had made of it [...] I have also examined with great interest the samples of clinochlore you sent me [...] M. [Alfred] Des Cloizeaux has been busy and he has just finished a big work on quartz. It gives a great many figures and many photographs, the only way to not let one's imagination take the place of reality. The symmetry attributed to the inner structure of certain crystals, e. g. amethyst, is only one particular case among many other more complicated modes [...] Pardon me, Sir, for going on like this. It is all to show you my delight to be having this exchange with you [...]" (transl.). Sénarmont did important research in crystallography. He was noted especially for his work on polarization and on the artificial formation of minerals. - First two sheets each have a tear in the upper right corner, but with no loss. 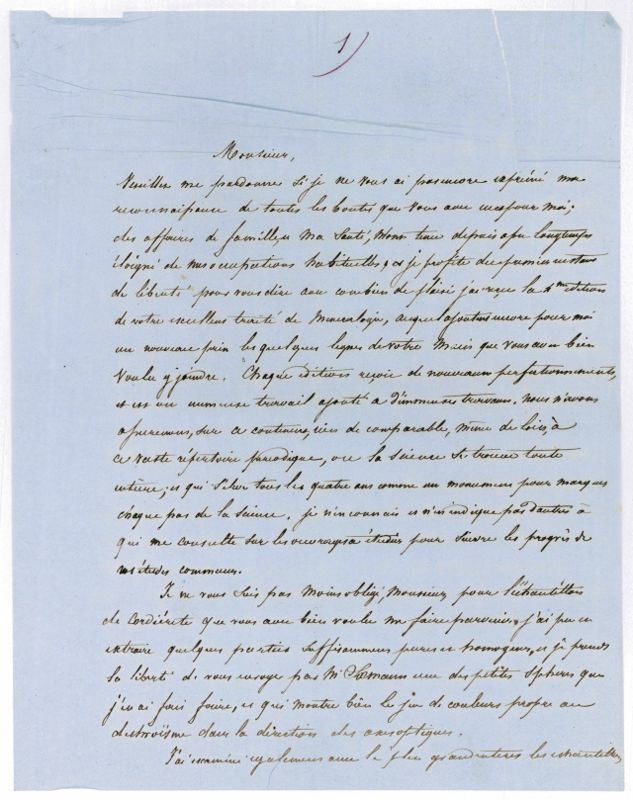 A long letter with good scientific content in very good condition..